Make a record of your child's hands and enjoy some messy handprint painting with this cute hedgehog! Keeping your fingers together, make a pale brown handprint horizontally at the bottom of your paper. This is your head. 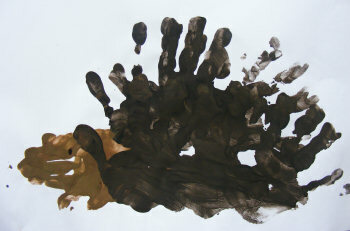 Make lots of dark brown handprints with your fingers spread out and up. These are your prickles. Finish off by finger printing a brown eye! Here's a fun way to use up those empty horse chestnut shells. Watch out for the prickles! This hedgehog collage is fun for ages - and as you can see it is very effective! Paper plate crafts are always popular, and this paper plate hedgehog combines painting, cutting and sticking, so it will hopefully be no exception!